The Generation III Good One Heritage Oven Stand Alone has a flexible temperature range; this cooker makes it easy to cook almost any type of food from BBQ to casseroles, veggies to deserts or whatever recipe you can dream up. Whether you are smoking or grilling, the Heritage Oven makes cooking delicious foods super-easy. Some other features certainly worth noting about The Good One Heritage Oven is the high-temp powder-coat paint. Other than withstanding the scorching temperatures that the Heritage Oven can put off, high-temp powder-coat paint provides protection, improves durability, and offers a nice clean finish. The two stainless steel doors with cool-to-touch handles also offer a high quality and professional look. Like the rest of The Good One line, the innovative design of this grill remains intact by placing charcoal and wood in a handy firebox with it’s own grill grate for direct grilling fish, burgers, or searing some fantastic steaks. The separate smoking chamber is located above and behind the firebox which is ideal for indirect cooking anything from ribs to brisket without the hot-spots commonly found on side-firebox smokers. How does the Good One avoid those hot-spots? An internal damper runs the entire length the grill so heat and smoke are distributed evenly from the firebox into the upper smoking chamber. The twist-style air intakes on the bottom of the firebox make temperature adjustments simple and repeatable. 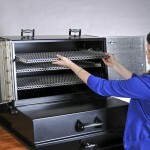 From low and slow smoking to high temperature grilling, it has tons of smoking and grilling space to get any job done. The Heritage Oven’s three adjustable and locking smoker grates and one firebox grate combine for a whopping 1,199sq in of total cooking area. You can also add an extra, optional smoker grate that increases the total cooking area to 1,531sq in. Best of all, with the removable internal ash pan, cleanup is a breeze. – Cart assembly with pneumatic wheels included.